Owning a book entails more than simply purchasing, trading, or borrowing it. It is the process of choosing the book that truly enhances the read. While I find great efficiency with my e-reader, I prefer the more traditional fare. Whether trawling through the stacks of an independent seller, sifting through family castoffs, or zipping through a monster box store, I find myself drawn to the printed page. Part of the draw may be the aroma of inked pulp or even the must of mildew. Perhaps it is simply my secret compulsion to dog-ear the pages? From genre to literary focus, my eyes flit from cover art to typeface. My hands caress spines and flip through the pages. In the end, the authors, characters, and topics grab my interest. This near-ritual drama transforms my decision to choice. The choice may be a used book or a freshly pressed publication. It could be poetry or prose. I will read it with relish, and I will own it. Tuesday, August 16, 2011. 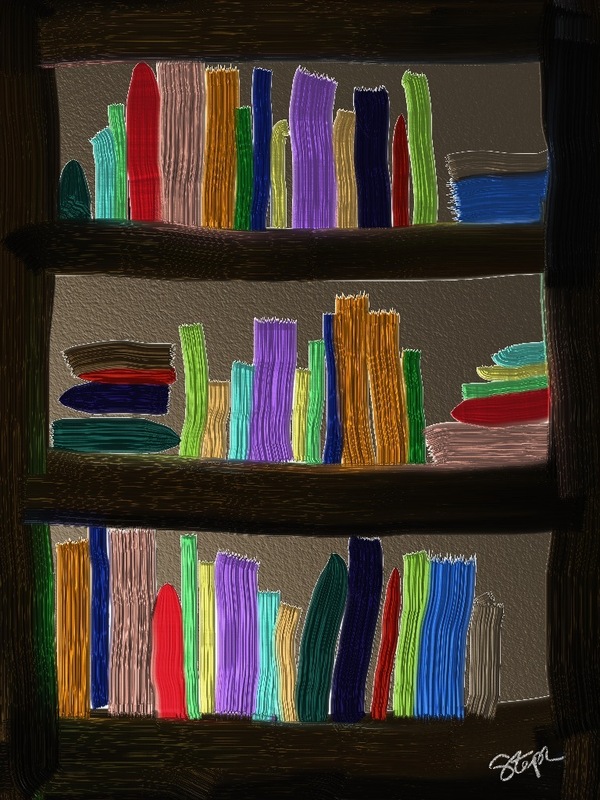 Today’s post is inspired by the NaBloPoMo prompt, “Do you prefer to own books or borrow them from a friend or the library?” I created the bookcase on my iPad using ArtRage.